Neurodevelopmental deficits of parvalbumin-immunoreactive γ-aminobutyric acid (GABA)ergic interneurons in prefrontal cortex have been reported in schizophrenia. Glutamate influences the proliferation of this type of interneuron by an N-methyl-d-aspartate (NMDA)-receptor-mediated mechanism. 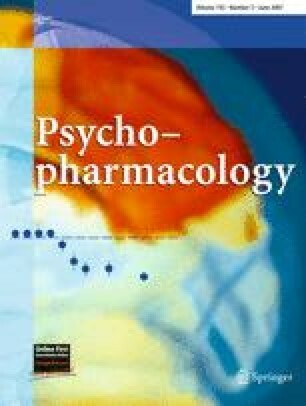 The present study hypothesized that prenatal blockade of NMDA receptors would disrupt GABAergic neurodevelopment, resulting in differences in effects on behavioral responses to a noncompetitive NMDA antagonist, phencyclidine (PCP), and a dopamine releaser, methamphetamine (METH). GABAergic neurons were immunohistochemically stained with parvalbumin antibody. Psychostimulant-induced hyperlocomotion was measured using an infrared sensor. Prenatal exposure (E15–E18) to the NMDA receptor antagonist MK-801 reduced the density of parvalbumin-immunoreactive neurons in rat medial prefrontal cortex on postnatal day 63 (P63) and enhanced PCP-induced hyperlocomotion but not the acute effects of METH on P63 or the development of behavioral sensitization. Prenatal exposure to MK-801 reduced the number of parvalbumin-immunoreactive neurons even on postnatal day 35 (P35) and did not enhance PCP-induced hyperlocomotion, the acute effects of METH on P35, or the development of behavioral sensitization to METH. These findings suggest that prenatal blockade of NMDA receptors disrupts GABAergic neurodevelopment in medial prefrontal cortex, and that this disruption of GABAergic development may be related to the enhancement of the locomotion-inducing effect of PCP in postpubertal but not juvenile offspring. GABAergic deficit is unrelated to the effects of METH. This GABAergic neurodevelopmental disruption and the enhanced PCP-induced hyperlocomotion in adult offspring prenatally exposed to MK-801 may prove useful as a new model of the neurodevelopmental process of pathogenesis of treatment-resistant schizophrenia via an NMDA-receptor-mediated hypoglutamatergic mechanism. This study was supported in part by Grant-in-Aid No 14370287 and No 15591207 for Scientific Research from the Ministry of Education, Science and Culture, Japan. The authors thank Ms Akiko Kato for her technical assistance.